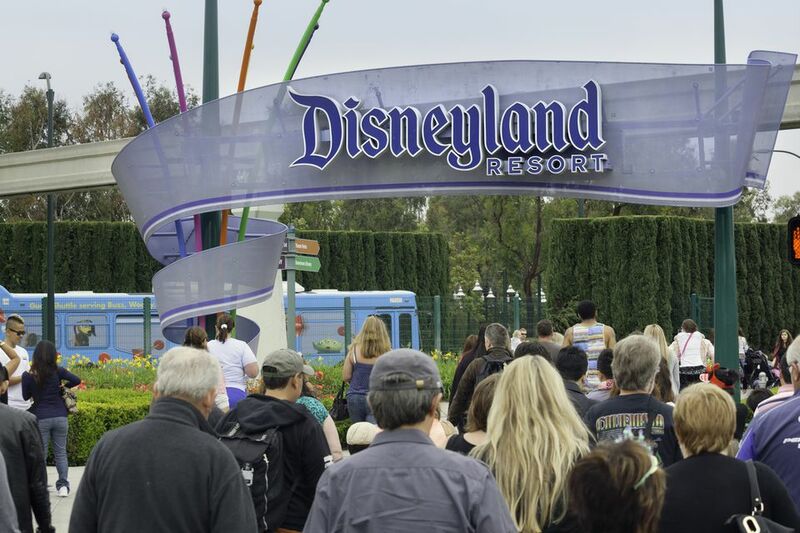 If you're heading to Disneyland and you're a guest with limited mobility, there are a few extra steps to consider when planning your visit. Here's a guide to everything you should know. A van equipped with a wheelchair lift is available to transport guests between the Mickey & Friends Parking Structure and the Downtown Disney District. Wheelchairs and electronic convenience vehicles (ECVs) must fit without force on lifts, ramps, and in other designated wheelchair spaces. Trained service animals are welcome, but they need to be on a leash or harness at all times. Many attractions are accessible to visitors and their service animals using the normal lines. Cast members aren't permitted to handle service animals, so if someone needs to look after your animal while you ride, you'll need a companion along to help. The park maps show locations where you can take your service animal to relieve itself and when it's done, you can contact any cast member, and they'll send someone to clean up. Start with the list of attractions that require guests to walk, ones where you can stay in your chair/vehicle, and ones that require a transfer to the ride vehicle at the Disneyland website. After you know which rides you'll be able to enjoy, think about time spent waiting in line and how long you are able to do that. On a busy day, the wait for some of the most popular rides can be close to two hours. Some attraction queues have enough space that you can ride your scooter in them, but at others, if you can't stand in the line, there are no places to sit in the queue areas and no easy options to wait somewhere else and join your companions when they reach the front of the line. Instead, use a Guest Assistance Card to get in through alternate entrances. See below to find out how to get one. If you can stand up but can't walk very far, you could park your ECV or wheelchair in the stroller parking area outside a ride and pick it up when you come out. If you have any kind of mobility issue, immediately after you get inside the gates, stop at City Hall (Disneyland) or Chamber of Commerce (California Adventure). You don't need to bring a doctor's note or other proof of disability, but be prepared to tell the cast member who helps you about your situation and what kind of help you need. The cast member who helps you can either recommend that you rent a scooter or wheelchair, or they can issue a Disability Access Services card, which you can show to a cast member wherever you need special assistance. This might include entrance to attractions through an alternative entrance, and if you're traveling with a group, the card may also allow your companions to enter with you, but the number of companions is determined by the issuing cast member. To use the card, approach any cast member near the ride entrance and ask where to enter. If it's a Fastpass attraction, start at the Fastpass return line. For more information for individuals who need help with other challenges, visit this page at the Disneyland website and this page, specifically about Disability Access Services. You can bring your own wheelchair or ECV with you, or you can rent one, either at Disneyland or from local area companies. However, a limited number of wheelchairs (manual and motorized) and ECVs are available at Disneyland, and you can't reserve them in advance. To avoid any issues, it's best to arrive about 30 minutes before opening time, especially if it's a busy day. On the plus side, the rental location is convenient, just outside the entrance. Renting is a good option if you can get around enough to get to the entry gate and if you don't want to handle taking it back to your hotel every evening or worry about charging the battery or other issues. Disney's ECVs are bigger than some you can rent and they can't go into Downtown Disney—only into the parks and the plaza area between them. See the current Disney rates and policies for rentals. They also ask for a refundable deposit. You'll need a photo ID, and to rent an ECV, you must be at least 18 years old. On the surface, Disney's rates look higher than other companies in the area, but by the time you add insurance and other fees (or if you need a model that carries more weight), the price differences may be minimal. If you need your vehicle all (or most) of the time, a rental from an outside company may be your best option. What is the weight limit for the model you're talking about? Some of the smaller, transportable scooters have a battery that comes out so you can bring just that (instead of the whole chair) into your hotel room for charging. And since these are smaller, they're usually easier to maneuver in the park. Will they deliver to your hotel and pick it up from there when you're done? Do they have employees on call any time the parks are open? Do they have passes so they can come inside and help you, or will you have to bring it out if there's an issue? What if it's stolen? Do you have to pay extra to get insurance for that? If their insurance doesn't cover it, try your homeowner's policy to see if it does. A number of companies offer ECV and wheelchair rentals near Disneyland. Try these options first. Deckert is often mentioned by people who post reviews online. They don't have a website, but the phone number is 714-542-5607. One Stop Mobility has a pick-up location at the Camelot Inn across from the Disneyland entrance. Be sure to mention the price you see on the website, which is a discount from their list rates. They pick up and deliver. These tips will help you ask the right questions to get the answers you need, and give you some things to keep in mind when choosing a hotel room near Disneyland that will best meet your needs. All of the hotel profiles on this site include information about number of floors and whether the property has an elevator, as well as whether they're on one of the Anaheim Trolley routes. They're all listed in the Disneyland hotel guide. If the hotel doesn't have elevators, call them directly to make a reservation, explaining your situation so they don't assign you to an upper floor room. If the hotel offers a Disneyland shuttle, ask if it can accommodate your wheelchair or scooter. If you don't want to take your scooter or wheelchair into the room, ask if the hotel can store it for you—some will even plug it in so it's all charged up, too. If you choose a hotel on the Anaheim Resort Trolley (ART) route, they have lifts that can easily load your chair or scooter onto the trolley. To find them, use this list of hotels on the Anaheim Trolley route. If you're planning on taking the scooter into your hotel room, it's a good idea to bring along an extension cord to allow for more flexibility to park it. Disney owns three hotels at the Disneyland Resort. Profiles, photos and reviews are in this Disneyland hotel guide. The Disney hotels have a limited supply of wheelchairs, but they don't have ECVs. If you'd rather not have your vehicle taking up space in your hotel room, ask if you can leave it with the bellman and pick it up the next day. They usually offer to charge it up, but it's a good idea to request that. And don't forget to tip the people who help you if they provide good service.